SCG’s 2016 Player’s Championship is in the books, with Joe Lossett having hefted the trophy up by Sunday evening. It was a three ring circus, with players competing in Standard, Modern, and Legacy. Despite battlegrounds in all three formats, we’re only looking at Standard in today’s roundup. Legacy isn’t worth looking at because prices are fairly stagnant these days without enough events to drum up dramatic shifts, and Modern didn’t have a lot going on we hadn’t already seen plenty of before. Add in that we’re just leaving the Modern PPTQ season and Modern Masters 2017 is slated for release in just three months time, and you can see why we shouldn’t expect much growth in that field with a handful of exceptions in the near future. Did you catch that, by the way? Modern Masters 2017 officially releases March 17th. That’s three months before GP Vegas, which the last two times has been held much closer in time to the set’s release. Instead, we’re now going to see Modern Masters hitting shelves eight weeks after Aether Revolt’s official release. If spoiler season starts two weeks before MM3, it will be a short six weeks between it and Aether Revolt. Early on in spoiler season people began getting excited about Verdurous Gearhulk, and this peaked just as the set released, with prices at nearly $20. It showed up in several Standard decks at the time, but the play pattern wasn’t strong enough to sustain those numbers at the time. Since then, the price has slowly eroded to around $7 to $8. We saw several players pack full sets of Verdurous Gearhulk at the PC this weekend, serving as a reminder that the card still exists, and still packs a punch. Standard looks fairly set right now between UW Flash, GB Spider Lava Axe, and Marvelworks, but that doesn’t mean Revolt won’t shake things up enough to make room for Verdurous. If it does, he could end up a consistent four-of in a third of the format. Should that come to fruition, a double up isn’t out of the question at all. The premium mythic slot of Kaladesh is currently held by Chandra, Torch of Defiance, but it’s a tenuous grasp at best. Torrential Gearhulk remains one of the strongest cards in Standard, and its range of replayable spells is about to be widened by Aether Revolt. Like its Verdurous brethren, Torrential Gearhulk is a powerful, potentially format-defining mythic that’s just waiting for an opportunity to take over. I can’t guarantee you that Aether Revolt will bring that to bear, but I can guarantee you that it’s possible. Weeks after Kaladesh’s release saw Torrential jump into the $30 range, so we know there’s strong expectations around this one. An opening weekend that sees it come out strong could rapidly push the price well above $20, and it could feasibly become the Primeval Titan or Sphinx’s Revelation of its respective format. Keep an eye on how things begin to shake out during spoiler season soon. One or two good instants could make a world of difference. We haven’t talked about lands much in Standard lately. Not since Khans of Tarkir was still in Standard anyways, when it was all about fetches and battle lands. When the UR fastland was spoiled a ways back I advocated keeping an eye on it, as the pedigree of UR lands is remarkable. It saw an uptick shortly after Kaladesh’s release towards $10, and has been settling since. After this weekend, I’m wondering if it’s getting close to the floor. Spirebluff showed up in quite a few Standard decklists, and was in every Grixis Modern deck to boot. With 21 months of Standard legality left, it seems almost guaranteed that this will break double digits at some point. Remember that the most useful Temples back in Theros Standard did that regularly. Inventions certainly change the equation here, so it’s difficult to put too fine a point on it though. So far we really only have Battle for Zendikar to look at as a template, but that set has behaved so significantly different than Kaladesh at every point that it’s almost useless as a reference. We’re left to work on the assumption that a fall set can still support a $10+ land. At this point, if any of them are going to, Spirebluff is probably the best positioned. 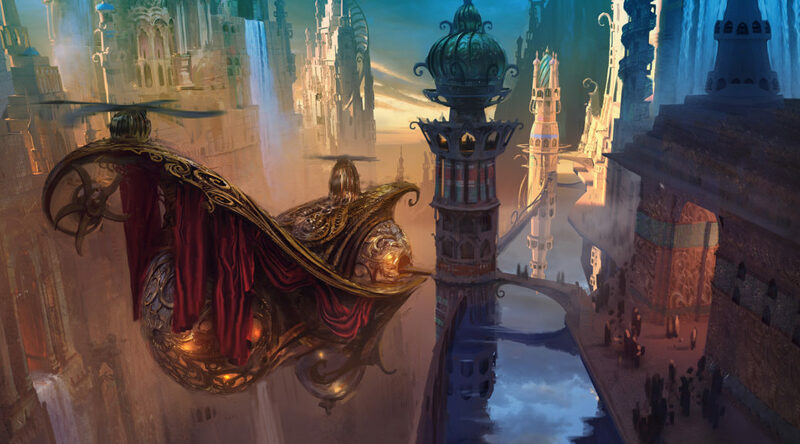 I would not personally get anything from kaladesh until right before the pro tour if you are just buying for speculation. The set will still be opened until the spring. What about the masterpieces? Are any of them worth getting now? Waiting until just before the PT may prove too late, as the hype will be in full swing and everyone will be in magical christmas land. The best time, truly, is just before spoiler season starts. That’s when people start getting ideas about what decks may look like, and prices begin to react. A strong energy enabler shown early would start pushing on Aether Marvelworks immediately, for instance. Of course, doing it before the spoiler season means you’re working without perfect information, so it’s a risk/reward thing. Inventions as an index are getting close to leveling out, but don’t look like they’re there yet. On the whole I’m not sure how comfortable I am about speccing on these in general yet. Others in the community will have dramatically different opinions than I on this, though.